NetStorm: Islands At War is a real-time strategy PC game, developed by Titanic Entertainment and published by Activision in 1997. 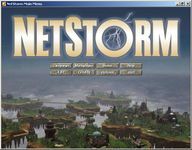 Although a single-player campaign and tutorial missions are included, Netstorm is chiefly designed for online play, allowing for games of up to eight players. NetStorm takes place in the world of Nimbus, a planet whose crust has been sent floating off in to the atmosphere by the never-ending battles between the three god-like beings called "The Furies", representing Wind, Rain and Thunder. The people now live on small floating islands, each with its own high priest; their only link to their patron Fury. The islands battle each other in order to capture and sacrifice the priests of their enemies to their own Fury so they may gain knowledge and power. Source: Wikipedia, "Netstorm", available under the CC-BY-SA License.